What tags set off towers? So I was thinking, what should I remove when lifting? Do absolutely all barcodes set of the alarms, even the ones that are just stickers without soft tags on most clothing? Or should I remove all tags I come in contact with? One more thing, if you don't see any physical towers, can you still be detected? Barcodes do not set off any alarms. Ever. They aren't anti-theft devices - the only purpose they serve is to quickly identify a product to a point-of-sale computer. There are anti-theft "tags", but they are actually more akin to stickers than tags. There are 3 common types of anti-theft tags: Acousto-Magnetic tags, RFID tags, and Spider Wrap. Acousto-Magnetic tags look like this. They are narrow, white tags, that are about the length of your thumb. They are usually deactivated by cashiers by passing them under a demagnetizer. One of the long sides is adhesive, allowing it to be stuck on the packaging of products. They can easily be peeled off. Sometimes, they are even put inside the packaging, so be sure to check there before walking out the door! 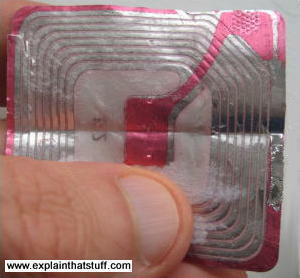 RFID tags look like this. They are larger stickers that have a spiral-shaped metallic circuit printed on the adhesive side. Be sure to peel back any stickers you see on the product you intend to lift - if you see that telltale metal spiral on the back, peel it all the way off, and discretely dispose of it. Spider wrap looks like this. Unlike the other tags, spider wrap is prominently wrapped around products it is attached to, like so. 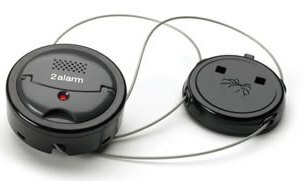 In this case, the tags themselves have an alarm built in to them. Do not cut the wires - that will set the alarm off. These tags have to be detached using a special detacher called an S3 Alpha key. These can be purchased cheaply online. Remember, even if you have detached an item wrapped in spider wrap, there may still be other tags hidden on or in the packaging. These are the most common types of tags, but they are by no means the only types. There are dozens of other anti-theft tags, especially for clothing. One more thing, if you don't see any physical towers, can you still be detected? Certainly. A few companies try to disguise their EAS towers, but most don't, since they think they work better as a theft deterrent when they are visible. Besides towers, you should also be aware of loss-prevention workers. Loss Prevention (LP) workers are workers whose job is to stop shoplifters. Some stores have them; some do not. Usually, they will either be monitoring the cameras to look for people concealing merchandise, or they will be walking around the store, disguised as a customer, following people they suspect of shoplifting. A good way to avoid attracting their attention is not to look suspicious, to conceal in a "blind spot" (an area where no cameras can see you), and to abandon your items and leave if you notice anyone following you. Lastly, even if you do set off the alarms on your way out, keep walking. Often, anti-theft tags will fail to deactivate when passed under barcode readers, meaning legitimate customers will set off the alarms on their way out. This means a lot of employees will completely ignore the alarms if they go off. With luck, you may be able to walk away. For more information on RFID tags, have a look at this article. Thank you; I will edit my comment to say this. I've been thinking about using the self-checkout lanes to pretend scan an item I intend to lift and pass it over the de-magnetizer to deactivate potential tags on the inside. Does this seem like a feasible plan? What potential pitfalls could there be? I imagine cashiers would be double on the lookout if they notice you have a high shrink item. I think you'd be better off detagging it yourself and walking out. Self-checkout lanes are usually watched pretty aggressively. Where I live, all the self checkout lanes have cameras pointing right at your face, and a monitor displaying the camera feed. Even if you got lucky and LP wasn't paying attention, when they eventually figure out what happened, they would have clear pictures of your face to send to the police, and other regional LP. If the item you took was valuable enough, the police may decide to run your picture through a facial recognition scan, which would identify you if they have another photo of you linked to your identity (like from a driver's license). I noticed self-checkout are always monitored by new sophisticated cameras, and there is also one Employee "Standing-by" in case people need help, ive never found them to be useful at all, now im suspecting they are just looking out for shoplifters. And there is almost always a lp nearby, probably hidden from view. And this is from TARGET, at first the mid-sized target had nobody in the self-checkout after it opened last year, i always thought, it would be so easy to walk out the back entrance. The cameras at the self-checkout seems to be much more sophisticated to the ceiling ones. you only need to be close to checkout, for those motion sensors to activate the cameras. i was on the other side of the shelf with gharadelli chocolates, and the self-checkout on one side, and i was able to activate the camera, simply by walking near the shelf on the other side. sometimes they are inside the products themselves, and some electronics have tags inside certain compartment. TI-84 CALCULATORS, are notorius for having magnetic tags, inside the battery compartment. For a long time i never knew what was setting off the towers at my school library, until one day i saw it was tag inside the compartment. Its much harder to guess where a tag is if, its inside a packaging of a product, super common in certain electronics, and spiderwrapped items. ive set off towers quite a few times, when i stole mtg cards, for years ever since the game card game out, ive stolen it, and never found once single magnetic tag. Only right before they introduced the new mtg, pokemon packaging did they put it in. i was so shocked when it activated it at a target one time(i got away though), when i went home and opened it, it at least 2-4 tags out of 4-6 packs i stole.